Congrats to the e-book giveaway winners! Congrats to my Ebook giveaway winners! 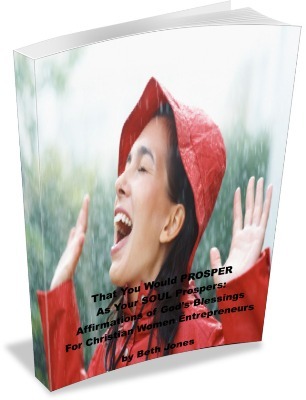 I loved the business ideas of each of the participants for this contest, and spontaneously decided on Friday to just bless all 3 of them with the Ebook, That You Would Prosper as Your Soul Prospers: Affirmations for Christian Women Entrepreneurs. Julie Black. Julie and her daughter feel called to a contemporary ministry for Christian women, to give them steps and strategies to take charge of their success in life by aligning with the power of God. Be empowered, Julie! As Julie said, when God calls, you answer! Alice White Hinckley. Alice’s goal is to help women embrace being successful entrepreneurs. Her desired learning skills for this year are adding an online presence for her existing business and possibly adding an additional online biz. Her passion is helping others prosper and embracing their gifts and the blessings established for them. Go, Alice! Tonja Gregory Bertog. Tonja’s goal is to help women struggling with depression and stress-related illnesses realize their self-worth and relevance in life. She’s a single mom and is currently between jobs, and she says she knows the struggles in trying to make it in the world. Right now she is counseling family and friends, giving advice online, but would love to have her own business. You can do it, Tonja! Congrats to all 3 winners! I pray this Ebook blesses you and gives you the courage and motivation you need to step out in faith with your business dreams! You can learn more about the Ebook, That You Would Prosper as Your Soul Prospers, by clicking here. Find out what God’s word and successful women entrepreneurs have to say about wealth, money, poverty, and mindset. God wants to bless you so much that you become a blessing to others! What would you enjoy as a give-away here at BethJones.net? Leave your comments below.